How "Social" Will The Motivation Show 2010 Be? 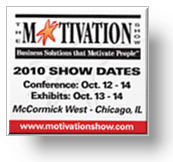 The Motivation Show will see a lot of huge displays on hand from some of the heavy players in the incentives business (including ourselves of course). BUT - what will the display of social media look like during that week? So many conferences are almost as easily followed via a Twitter hashtag as they are by physically attending them. People who either can't make it to certain seminars because of being in another one or not being able to attend the event period are able to catch some of the highlights through social sharing. The social media is losing its buzz but not because of a lack of importance - because it is becoming mainstream enough to lose "buzzworthiness." It's transitioning from a "new shiny tool" to a true communication medium for businesses and the people who run them. How will we see social being used at the show? Using Twitter, a hashtag has evolved for the show using #moti. For those not completely familiar with Twitter, a hashtag is an easy way to filter out conversations around an event. One would be able to save a Twitter search for #moti and see only tweets with this hashtag. Hear something noteworthy in a presentation? Quote it and tag it with #moti at the end. See something worth talking about at a certain booth? Tell everyone about it - adding #moti at the end. The Motivation Show itself is active on social media this year. In addition to their website, they have set up a group on LinkedIn filled with discussions and updates about the show and its attendees. The Motivation Show is also active on Twitter (see @MotivationShow), helping retweet and promote attendees out in the Twittersphere talking about the show and also adopting the #moti show hashtag. Others have even started a discussion on the show, even suggesting having a tweetup for the active social media participants (initially sparked by @kmillersmith I believe). Aside from promoting booths and presentaions, other people plan on taking other initiatives outside of Twitter. Some will write up blog posts about their experiences. Viral video will most likely be a result of the show as well, as interviews and recaps will begin to appear on YouTube following the show. Paul Hebert of i2i spoke on his blog of streaming live video from the show and possibly even broadcasting his monthly podcast "Influence Insiders" from the show floor. Into geolocation? Be prepared to see some interesting useage of applications like Foursquare, Gowalla and/or SCVNGR while walking the floor. What will we we doing? Us along with Helping Hand Rewards will be active in the above mentioned activities. We'll be jumping in on discussions about the show through Twitter hashtags. If you take a look in the right column of this page, you'll see a constant stream of #moti tweets (under Motivation Show Convo). If anything else, keep coming back to this page and see what attendees are saying in the stream. Along with some post-show blog reflections (found here and on HHR's blog as well) you may see some other tricks up our sleeve (potentially viral video, geolocation fun etc). Keep your eye on this blog and Twitter (@hinda_incentive) to see what's happening! Those are just some of the emerging technologies to keep an eye out for whether you're browsing the show floor or watching from afar online. Who else will be jumping in the social media pool with us? What other technologies do you see being used during show week?